Jon Stewart, Stephen Colbert Plan DC Rallies Spoofing Glenn Beck's : It's All Politics Comedians Jon Stewart and Stephen Colbert plan DC rallies for late October to spoof and counter Glenn Beck's "Restoring Honor" rally. On the heels of FOX News personality Glenn Beck's "Restoring Honor" event, comedians Jon Stewart and Stephen Colbert have announced plans to host two gatherings in Washington. According to the New York Daily News, "Stewart hopes to garner the '70-to-80 percent of Americans who aren't extremists on the right or left.'" We will gather on the National Mall in Washington, D.C. A million moderate march, where we take to the streets to send a message to our leaders and our national media that says, "We are here! We're here, though, until six, because we have a sitter!" 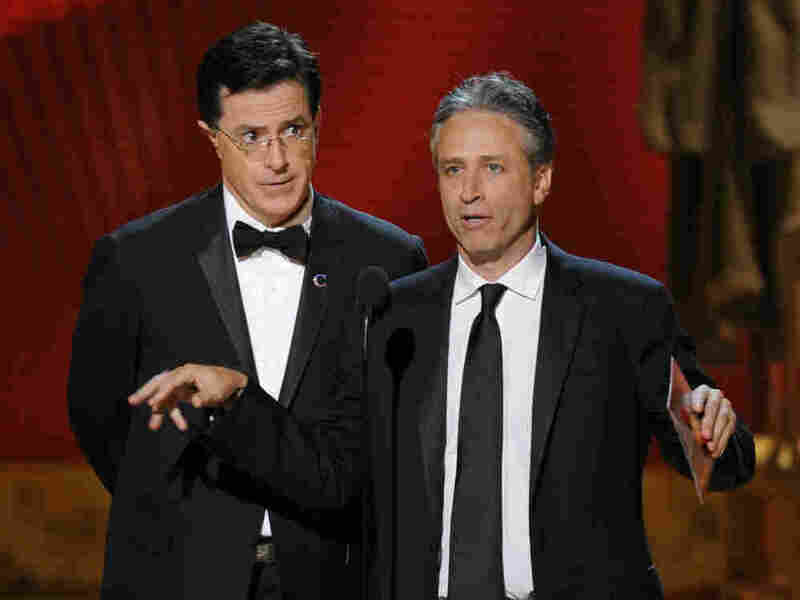 According to The New York Times, "the rally will clearly have some comedy elements (as well as guest stars, Mr. Stewart said), and his partner on the Comedy Central cable channel, Stephen Colbert, appeared on the show in his usual conservative blowhard persona to threaten to infiltrate the rally." Mr. Stewart also promised to supply the crowd with signs if they did not bring their own, including as examples, "I Disagree With You, But I'm Pretty Sure You're Not Hitler," and "Take It Down a Notch, America." You may be asking yourself right now, sitting at home, "But am I the right type of person to go to this rally?" The fact that you would even stop to ask yourself that question, as opposed to just, lets say, jumping up, grabbing the nearest stack of burnable holy books, strapping on a diaper, and just pointing your car towards D.C. That means i think you just might be right for it. On his show, Colbert encouraged his viewers to go to the National Mall, "because now is not the time to take it down a notch, now is the time for all good men to freak out for freedom."